Glass conservatories are a costly investment and a great asset to any home. 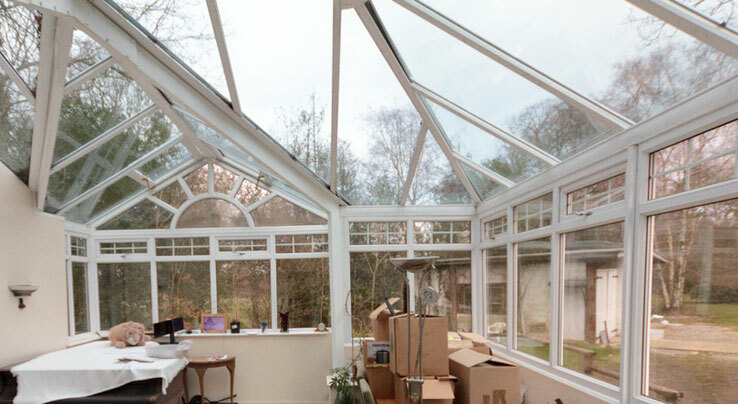 Over time, Conservatory roofs and frames can become dirty. They can become clogged up and discolored with moss, dirt and residue. If left untreated, unclean conservatories can satin and need a costly restoration. Keeping you conservatory clean will greatly reduce this risk and the need for costly repairs. But conservatory roofs and fittings are difficult to clean. That why we often arrive at customers houses with their conservatory roof a pleasant shade of green. But don’t panic, we can even restore your conservatory to its former glory. With our specialist tools we can clean conservatory roofs easily with great results. We offer a full range of services, this includes cleaning and restoration of all UPVC windows and doors, gutters and glass/plastic roofs. So if you’d be interested in our comprehensive cleaning service contact us today!